Product prices and availability are accurate as of 2019-04-15 07:53:08 EDT and are subject to change. Any price and availability information displayed on http://www.amazon.com/ at the time of purchase will apply to the purchase of this product. For any coffee lover, having all your favorite grounds, pods, powder and liquid creamers, and beans close at hand is an absolute necessity. But why take up valuable space on your kitchen counter or in the office break room? 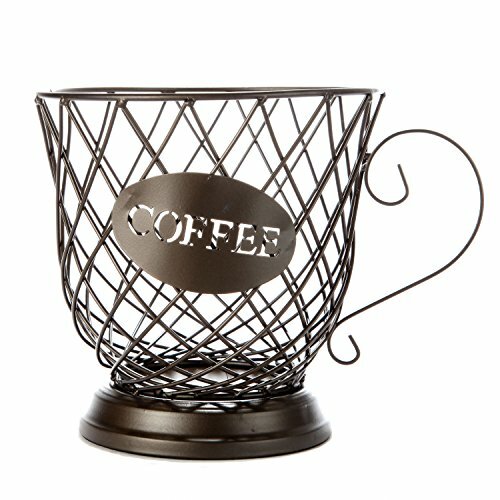 With this metal wire basket, you can easily store everything you need for your perfect cup of coffee in one convenient place. This basket is made of thick metal wire in a rich, dark brown color. This wire is woven into a unique criss-crossed pattern to form a diamond-like lattice. This basket also has an elegant, curved handle and a sturdy base for added stability. This base has a slight tiered effect, resulting in a traditional coffee or teacup silhouette. Another fun feature of this basket is its small oval "coffee" sign. This Coffee Cup Storage Basket is both functional and attractive, giving you a convenient space-saver and a chic art piece, all in one. The basket has a diameter of 7" and is 9" high. This makes it large enough to store multiple coffee pods and other kitchen or food items yet small enough to sit directly on the counter next to your espresso, cappuccino, latte machine, or single-serve brewer. The Coffee Cup Pod Storage Basket is also great for storing fruit, veggies, and other food items as well as coffee or coffee pods. As such, it makes an excellent addition to any kitchen, office break room, or hotel breakfast area. 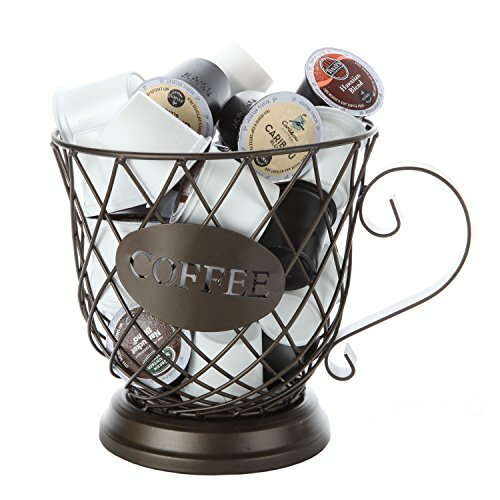 These baskets also make wonderful gifts that any coffee lover in your life will be delighted to receive. No assembly is required. This basket is intended for indoor use only. With this convenient coffee pod holder, it's never been easier to enjoy your java!